Tracy Michelle Arnold as Emily Dickinson in “The Belle of Amherst.” Photo by Maureen Janson Heintz. Get to Know Emily Dickinson, in Two Crows Theatre Company's "The Belle of Amherst"
Regarded as an eccentric literary recluse, there are few poets more mysterious or fascinating than Emily Dickinson. Virtually unknown in her lifetime — she saw only ten of her poems published — her voice is now standard study in high school English classes and she is often grouped with Emerson and Whitman as unique and important 19th century American writers. So it’s not surprising that William Luce’s one woman show about Dickinson’s private life, “The Belle of Amherst” was such as success when it debuted in 1976. Whole generations had grown up wondering what it would be like to be a guest for afternoon tea in the Dickinson family home in a small town in Massachusetts. Two Crows Theatre Company, a new troupe in Spring Green, gives audiences just such a glimpse into her private world in their current production of “The Belle of Amherst,” featuring American Players Theatre favorites, both onstage and behind the scenes. Colleen Madden directs Tracy Michele Arnold in the solo piece, which is delightful for both its intimacy and its entertaining portrayal of the thoroughly unconventional writer. The narrative is a mixture of stories about life in her small town; Dickinson’s personal disappointments and aspirations surrounding her writing; relationships with teachers, editors, friends, siblings, and her cold, authoritarian parents; and flashbacks to key moments in her life that shaped her present. Interspersed with biographical scenes and musings on the meaning of life, the existence of heaven, and Dickinson’s disdain for the conventional, Arnold recites many of the poet’s pieces. Some feel like presentations while others blend seamlessly into her exuberant conversation. “Because I Could Not Stop for Death,” “Success is Counted Sweetest,” and “Hope is a Thing with Feathers,” stand out for their familiarity, but others sneak up on the audience as a natural, extended thought. And it is to both Madden and Arnold’s credit that the play, which could easily be static and dour, shows so many colors of the poet, rising and falling with events that unfold over a lifetime instead of relying on a standard dramatic arc. Performed in the back room of the former Village Tavern, (now called The Jefferson) the large, central stage is filled with period-esque furniture, including Emily’s bedroom and a large Victorian inspired parlor. Madden makes good use of the space and Arnold is seldom still. Her blocking follows her thoughts — flitting from one subject to another, often while she performs small domestic tasks of wrapping a cake to send to the neighbors, winding balls of yarn, or serving tea. In a signature white dress and plain, chestnut wig, Arnold makes a convincing 19th century spinster, who considers herself plain and unremarkable. 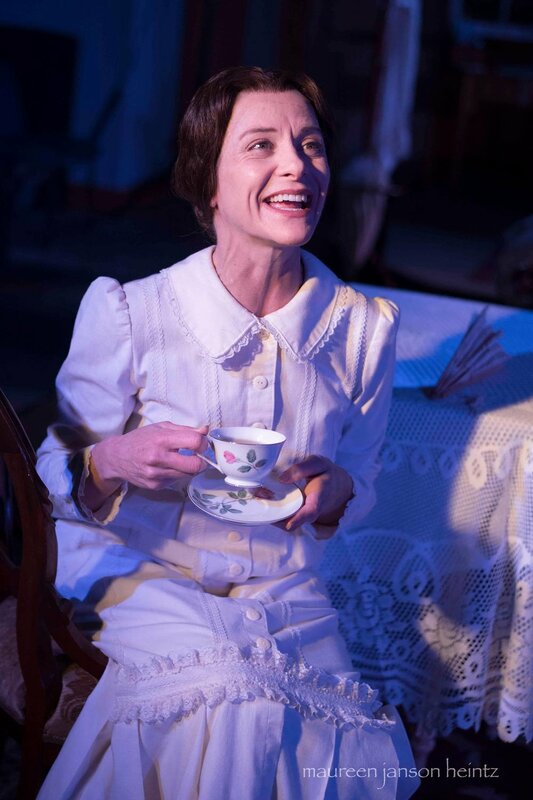 Playing only through February 16th, “The Belle of Amherst” is like visiting an old friend, warmed by a cup of tea on a cold winter’s night. It is not only worth the drive, it’s an auspicious start for a new theater company.